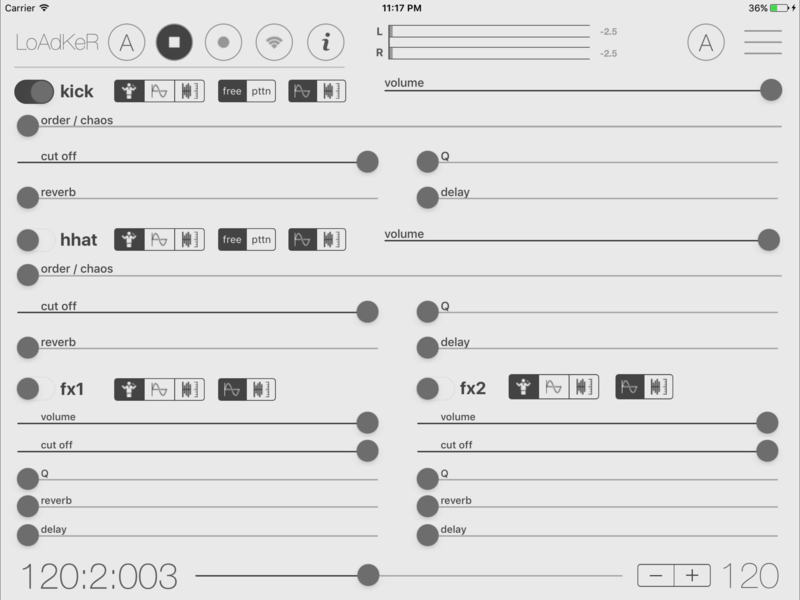 LoAdKer is a rhythm generator that uses fractal sequences as a means to produce complex but musical results. The software was developed by Ax.Art Creative Software, a multifaceted organization founded by Achilleas Sourlas, a musician and music software developer and is a product of his research into the use of fractals for music composition. It currently runs on iPads with iOS 9.2 or above. LoAdKer uses Csound as its sound engine, a powerful audio programming language which was developed in the mid-1980s at the Massachusetts Institute of Technology (MIT) by Barry Vercoe. This software uses libcsound and libsnd (unmodified), both of which come under the LGPL v2.1 licence. If you would like to link the program against a modified version of the above libraries, contact the developer. The use of LoAdKer is pretty straightforward. The program was designed as a real-time performance tool, therefore most of its functions can be accomplished within the main view with the exception of functions that have to do mainly with saving / loading performances as well as handling audio and synchronization. These can be accessed through a separate menu. LoAdKeR uses a total of four instruments: kick, snare, fx1 and fx2. Every instrument has three views: performance, synth and sampler. Performance mode - It contains general performance controls such as volume, filter cutoff, reverb and delay. Synth mode - It contains controls that are related to the synth audio engine. The controls vary for every instrument. Sampler mode - It contains controls related to the sampler audio engine. Every instrument has also an audio engine control, that activates one of the two of the instrument's audio engines, synth or sampler. All four instruments have a slider called order / chaos that controls the degree of "chaos" regarding the behavior of the instrument. Values near the left edge produce more repetitive, minimalistic patterns, whereas near the right edge the results become increasingly unpredictable. Kick and HHat have an additional set of playing mode controls. The playing mode control works as follows: when free is selected, the instrument behaves as described above (related to order/chaos slider). Pttn (pattern) however acts as a sort of "beat with fills" mode, in which the kick for example plays a four-on-the-floor beat for three bars and on the fourth it behaves according to the value of the order / chaos slider. Hhat behaves in a similar way too. 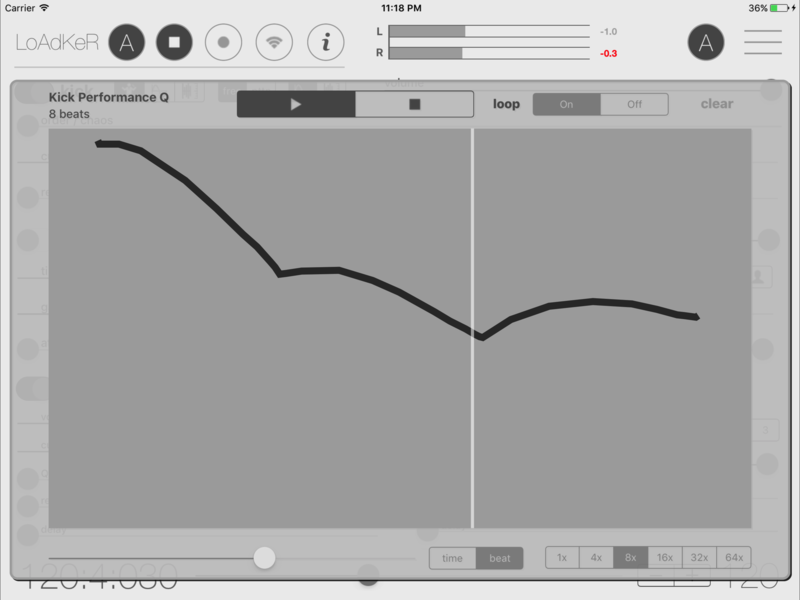 The process is simple: draw, choose between time/beat-based duration, choose loop on/off and press play. The automation will start on the next beat. There is a volume meter that displays peak levels, which can be reset by tapping it. LoAdKeR also supports Ableton Link synchronisation, as well as IAA/Audiobus routing so it can work with any compatible apps. The user has the option to record the entire performance as an audio file, which can be later exported through a number of ways. The format that LoAdKeR currently uses is 44.1 KHz, 16 bit stereo WAV. larger buffers mean a better possibility of glitch - free performance especially on older devices, but the trade-off is also bigger latency), as well as the ability to import and export performance recordings and samples through a number of different options, including iTunes, Audio Copy/Paste, Audio Share and Dropbox. You can contact the developer here. © 2013 - 2017 Achilleas Sourlas. All rights reserved.